Monsanto would have the world believe that genetically engineered crops are taking over. In fact, despite extraordinary powerful marketing, patents that trap farmers, criminal behavior such as bribes to governments (Indonesia, for example), and threats to farmers, they are limited to a few countries and a few varieties, and a number of varieties have failed in the market. 1. WHO BENEFITS FROM GM CROPS? The real beneficiaries of the GM system are biotech companies which profit from patents, expensive GM seeds, and increased pesticide sales. Poor farmers in contrast are squeezed by escalating costs. After more than a decade of commercialisation, GM crops continue to occupy just a small share of the total crop area harvested in the world. The ISAAA ranks some 13 countries as "biotech mega-countries", each of which plants at least 50,000 ha. Although the designation "mega" implies these countries sow vast tracts of land with GM crops, in fact the 50,000 ha threshold is so low that GM plantings make up a mere 2.4% of global agricultural crop land. Nearly 90% of the area planted to GM crops in 2007 was found in just six countries in North & South America, with 80% in the US, Argentina and Brazil. One country alone, the United States, plants over 50% of the world's GM crops. Less than 3% of cropland in India and China is planted with GM crops, almost exclusively GM cotton. In the 27 countries of the European Union, GM crop cultivation represents a mere 0.21% of agricultural land. Only four countries plant GM crops on more than 30% of their arable land: the US, Argentina, Paraguay and Uruguay. The area of arable land in Paraguay and Uruguay is so small that even these high percentages amount to comparatively little GM crop. There has also been a decade-long stagnation in the diversity of GM crops. As in the mid to late 1990s, only four crops - soya, maize, cotton and canola - comprise virtually 100% of biotech agriculture, as even ISAAA is forced to concede. Biotech versions of rice, wheat, tomatoes, sweetcorn, potatoes and popcorn have been rejected as unacceptable in the world marketplace (Center for Food Safety, August 2006). The initial approval of GM alfalfa in the US was reversed in 2006 by a federal judge, who castigated the US Dept of Agriculture (USDA) for failing to conduct a serious assessment of its environmental impacts (FoEI, 2008). More than a decade of experience in the United States demonstrates that GM crops have contributed substantially to increased pesticide use and an epidemic of herbicide-resistant weeds. Resistant weeds have prompted biotechnology firms to develop new GM crops that promote pesticide use still more. The use of mechanical tillage to control resistant weeds is also increasing, contributing to greater soil erosion and greenhouse gas emissions. The biotech industry continues to develop pesticide-promoting, herbicide-tolerant gm crops. Pesticides are chemicals that target weeds (herbicides), insects (insecticides) or other pests. Pesticide-promoting, herbicide tolerant crops continue to dominate agricultural biotechnology. Four out of every five hectares of biotech crops worldwide were engineered for heavy applications of chemical herbicides. 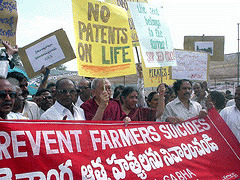 Agricultural biotechnology is essentially pesticide promoting technology. The biotechnology industry has continued to focus its development efforts on new pesticide-promoting crop varieties. Of the four new biotech crops approved by the USDA from November 2006 to December 2007, two were herbicide-tolerant (soybeans and rice). One insect-resistant corn and one virus-resistant plum variety were also approved (APHIS, 5 October 2007). The most significant developments in biotech agriculture are new GM crops that tolerate heavier applications of chemicals, and that tolerate two herbicides rather than just one. As discussed further below, this is the biotechnology industry's short-sighted "solution" to the epidemic of herbicide-resistant weeds that are plaguing American (and world) agriculture. None of the GM crops on the market are modified for increased yield potential. Corporations' research and product pipelines continue to focus on new pesticide promoting varieties that tolerate the application of one or more herbicides. For instance, of the 14 GM crops awaiting USDA commercial approval, nearly half (6) are herbicide-tolerant: corn, soybeans, cotton (2), alfalfa and creeping bentgrass (for golf courses). None of the others represent beneficial new traits. Corn and cotton with insect-resistance are minor variations on existing IR crops. Virus resistant papaya and soybeans with altered oil content are already approved, though not grown to any significant extent. Carnations engineered for altered colour are a trivial application of biotechnology. One GM corn is engineered for sterile pollen, while another engineered to contain a novel enzyme for "self-processing" into ethanol presents potential risks to human health. The longer-term future of biotech agriculture is also dominated by pesticide-promoting crops. Field trial permit figures are the best predictor of trends in GM crop development. Over one-third (36.3%) of active field trial permits for GM crops in the US involve one or more herbicide tolerant (HT) traits. These 352 active permits for field trials of HT crops encompass 18 different plant species and tolerance to more than eight different herbicides. Glyphosate-tolerance is by far the most common HT trait in field tests, though others, especially crops tolerant to dicamba herbicide, are also being extensively tested.